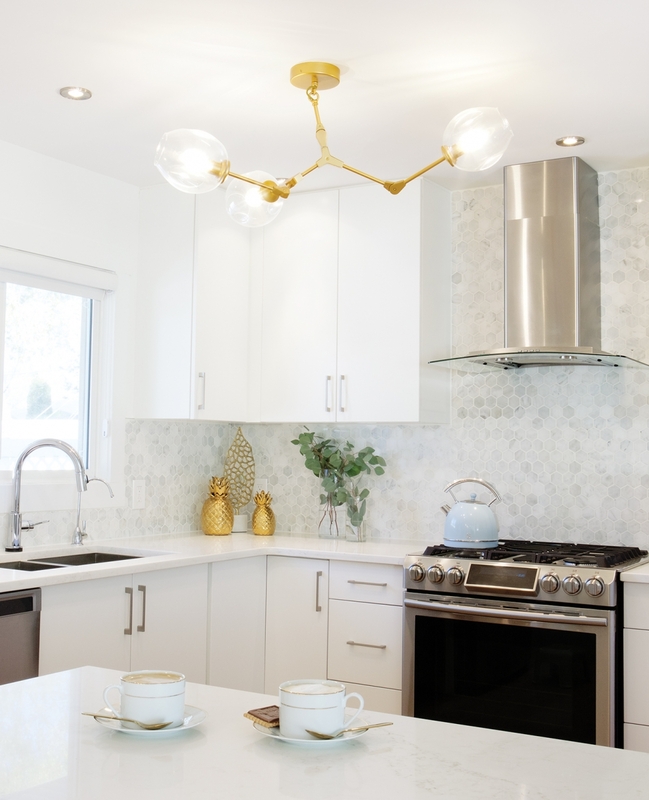 A North Glenora renovation sees homeowner sweat the small stuff. Mecca Fayad sits across her large marble dining table, sipping a glass of mint and cucumber water. Large gold earrings are reminiscent of the gold accents spun throughout her home in the chair legs and light fixtures. Her bold red lipstick stands out against a black blouse, just as royal blue barrel chairs are the focal point of an otherwise neutral living room. It’s a testament to how carefully curated each item in her home is, thoroughly reflecting her personality. For more than four months, Fayad constantly supervised the renovations, all while working her nine-to-five job as a chiropractor. On a tight budget, she saved money wherever she could. Before work, she ran errands for her contractor, RML Construction, often getting to Home Depot as it opened at 7 a.m. On the weekends, she would compare furniture prices across the city and do smaller renovation jobs herself. Fayad explains how she tried to use leftover tile for the laundry room, only to realize there weren’t enough tiles for the entire room. She found herself, at midnight, pulling up all of the work she had already done only to re-tile it again the next day. Throughout the home, Fayad has brought in small details to liven up the otherwise neutral tones of the house. Golden chair and table legs catch the eye across the room, and pops of pink and navy warm up the otherwise cool, modern tone. Overhead, atom-shaped light fixtures pay homage to Fayad’s science degree while casting a glow over new hardwood and a Canadian made F2 couch – ergonomic, of course. The Pinterest-inspired theme is a stylish setting for the young doctor, but she made sure to invest in some timeless pieces. 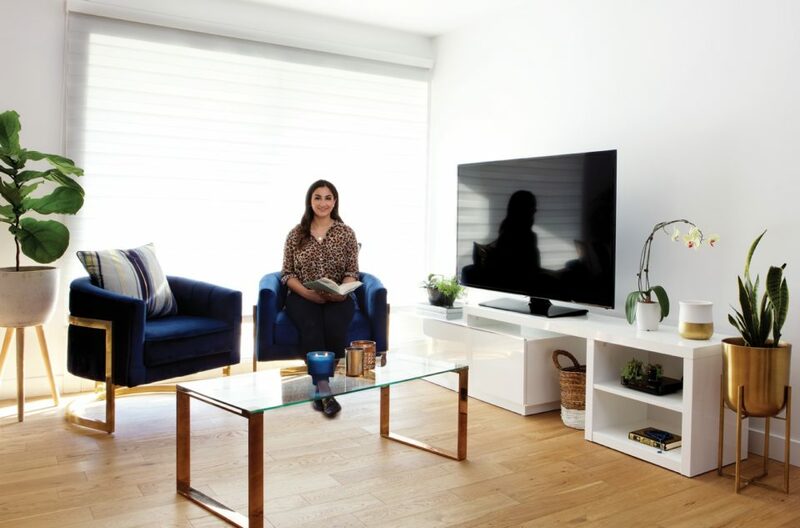 Originally from Lac la Biche, Fayad says she’s a small-town girl at heart and made sure to bring some natural elements into her centrally located home. The corner lot was entirely resodded (with plenty of help from her father) and a pine tree removed to make way for a new perennial garden. Inside, generous bouquets of gladiolas sit on nearly every surface, a perk she gets from the floral shop, Fabloomosity, in return for chiropractic services. 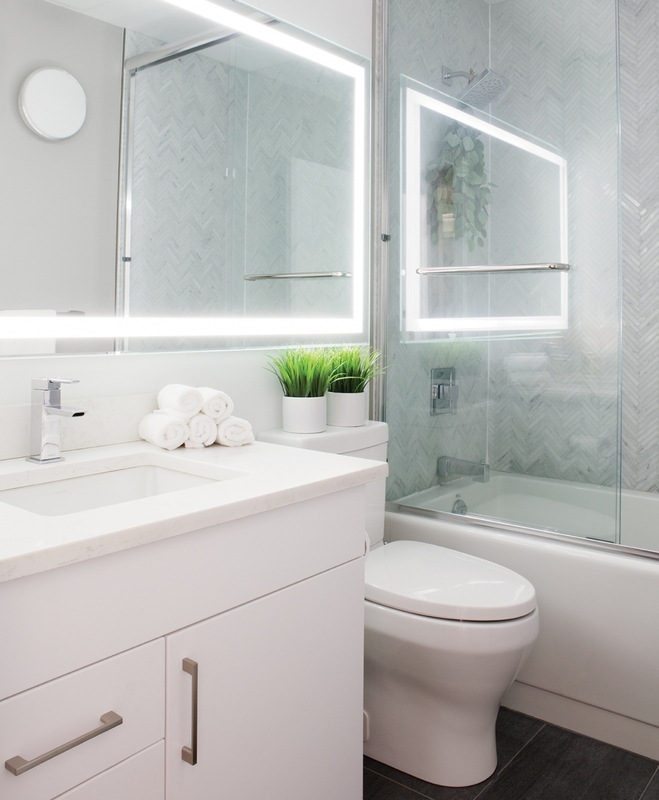 The new and improved bathroom features a large LED mirror that offers ambient lighting for getting ready in the morning. Fresh eucalyptus leaves hang against herringbone shower tiles, acting as natural essential oils when they react with steam. Around the corner in her home office, a large gold-trimmed desk often gets pushed out of the way to accommodate a chiropractic table for at-home adjustments. Atop a bohemian-style pink rug sit half a dozen HomeSense bags filled with brightly coloured napkins and party favours for an upcoming party.